At this time of the year the nettles are just starting to push out of the ground around here they are about four inches high. Depending how sensitive your hands are you may or may not have to wear gloves when you pick them. I usually just pick them with my bare hands. The easiest way is to just pinch off the top two to three sets of leaves. It makes a very pretty tea. 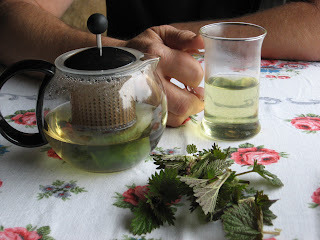 Those are nettle leaves in front of the tea pot. In the spring I have this for my morning tonic. They are also very good stir fried and we often mix them in with the leeks when we cook them. Below is an omelet made with wild leeks and domestic mushrooms and broccoli. In the cup is apple cider that we pressed last fall. There are many apples in the wilds and peoples yards that go to waste. Just one tree of small 'worm eaten' apples produced over thirty gallons of cider. The worms don't affect the taste and they 'certify' that it is pesticide free. As usual when we go out for our exercise walk we take along our camera and plastic bags as we never know what we will come across. 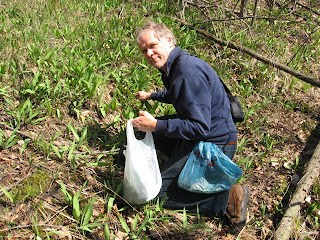 Here is John picking wild leeks. This is a spot that is on a South facing creek bank which means they will be one of the first areas of the season to mature. Some other areas they are just poking out of the ground. But that is fine as when the ones on this bank are to mature to pick these in a cooler spot will be ready to pick. If you pay attention to the micro climates you can extend the harvest season of most any of your plants. We also had salmon caught from lake Michigan. The only thing not free from the wilds is the pot of rice which is nearly free as it only costs about 30 cents as we buy rice in 50 pound bags. Here is a picture of our "wild" lunch he had to day. Stir fried leeks and nettles in the front dish. Another dish of garlic mustard stir fried with sausage. This was a bit on the bitter side but I still enjoyed it. A week of cold weather has slowed down the coming of spring plants. I just got back from a weekend of being in the Southern suburbs of Chicago. They have some really nice forest preserves that I always try to spend some time in when I’m down there. This is a nice time of the year to get the lay of the land as you can see a lot further into the woods and have a better idea of what’s there. Latter in the summer you can barely see beyond the first few rows of trees. Again I was glad I didn’t have to survive off the land as there is not a whole lot in plant food yet. Saw lots of deer and plenty of raccoon tracks. I love how there is such an oasis of animals and plants in the midst of one the biggest cities in the US.